I am sitting at the bar with Jean Broillet at Tired Hands, his brewpub in Ardmore, sipping “Herbert West,” a coffee IPA. But it doesn’t taste like coffee. It tastes like blueberries. Broillet explains that the mosaic variety hops and Ethiopian Worka beans they chose for this beer (brewed with ReAnimator coffee, which is cheekily named after the eponymous character from an H.P. Lovecraft story) both have strong blueberry profiles. The combined effect “really shreds,” he says, and I have to agree. Whatever his secrets, they are working. 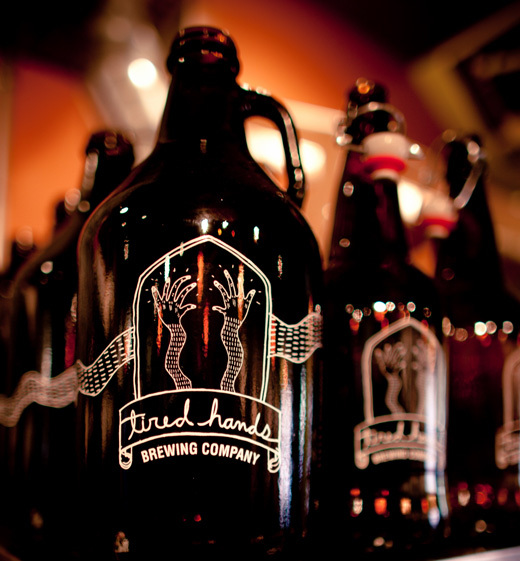 Since opening in June of 2012, Tired Hands has earned a stellar reputation. Their house beers, Hop Hands IPA and Saison Hands, and a litany of weirder beers (think passion fruit sour ale and lychee green tea Berlinerweisse) have been amassing a growing fan club of adventurous drinkers —“organoleptic cartographers,” as Broillet calls them. His 10-plus years of brewing experience is evident in the way that all of his beers, no matter how out-there, are balanced and bright. “Every strange beer we make is based on a structure of solid, sound brewing practices and technique,” he says. Thus, the brewery is experiencing what Broillet calls the “good/bad small business problem” of demand far outpacing supply. They plan to add a much larger production facility in 2014, greatly increasing their brewing capacity. Currently, all the beer is made in a small fermentation room on-site at the pub. Brewing their beers mere steps away from where they’ll be poured is the cornerstone of Tired Hands’ commitment to keeping it local. Story by Emily Kovach | Photos by Mike Donk.